Click here to email/forward the above exposé along with the complete exposé package which includes all the resource attachments and references to friends, concerned parents, students, teachers and administrators, boards of education, community leaders, politicians, federal and state lawmakers, political and education groups, civil-rights groups, constitutional attorneys, music/arts advocates, teacher unions, all media. Be creative! 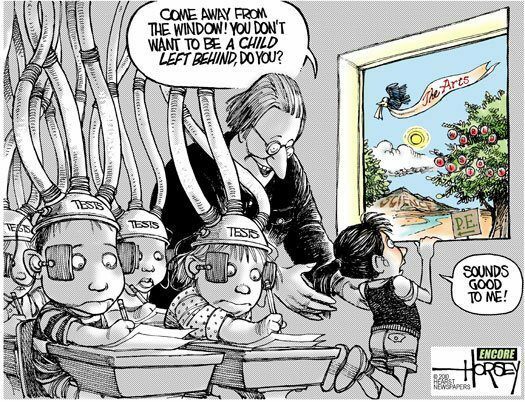 A3 → Teacher: "over tested zombies are invading my classroom"
A5 → "Dances of the Imagination"
Their Big-Gov Unequal and Denied-Access and the Invisible Disadvantaged: Beware of the High-Stakes Education Rule: What is tested with “high-stakes” accountability gets taught; what is not tested gets unequal or denied-access.† While the K-12 student of “socio-academic advantage” [high(er) test score] gets whole-student curriculum unequal access or can outsource to learn, the “invisible” disadvantaged [low(er) test score] learns to grow up with narrow, separate and disabling denied-access education (A4). Parents and Students for Music and Arts is not affiliated with, or endorsed by any school district. PSMA is a combined effort of local parents and community leaders in support of whole-student education which includes music and other arts for all. © 2014 AllArtsAllKids.org ● All rights reserved. Our Testing is Illegal "Endorsement"